The Skinny: This Japanese blockbuster may have become dated over the last 20 years, but it still features a great cast and lots of twisted Japanese period fantasy visuals sure to appeal to the cult film buff. Honestly, who can resist a film with giant crawling creatures that fly? Kadokawa Films was the Japanese equivalent of Jerry Bruckheimer Films during the late seventies and eighties. With a successful formula that teamed talented filmmakers with pretty young idols, Kadokawa Film ruled the Japanese box office and popular culture throughout the period. One of the most successful "Kadokawa Idols" was Hiroko Yakushimaru, who found fame with the 1981 classic Sailor Suit and Machine Gun and has remained active in the film industry since then. 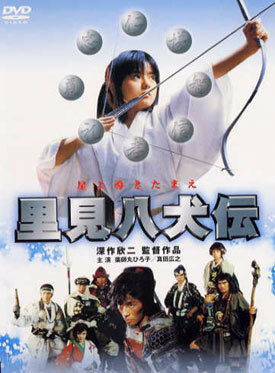 The 1983 fantasy extravaganza Legend of the Eight Samurai was not only made at the height of Yakushimaru's popularity, but was also one of the biggest productions of the Kadokawa era. Is this 24-year-old film equally spectacular today, or has it shown its age in the modern era of CGI? Based on a novel by Toshio Kamata that retells a well-known classic tale, the film stars Yakushimaru as Princess Shizu, whose family has just been killed by a vengeful rival clan. On the run from their killers, led by evil monster/human-hybrid Tamazusa (a young Mari Natsuki), Princess Shizu is helped by two warriors. One of them, Dosetsu (Sonny Chiba), tells Shizu that they are two of eight warriors dictated by an ancient legend involving a dog to help her defeat the evil clan. United by eight pearls, the warriors come from different walks of life, from sworn enemies to assassins to even children. In the midst of it all is Shinbei (Hiroyuki Sanada before international stardom), a wanderer who initially captures Shizu to cash in on the reward, but ends up becoming her protector against the evil samurais. Meanwhile, Tamazusa uses all kinds of way to stop Shizu from finding all eight pearls, from flying centipedes to humanoids with poisonous breath. No kidding. The man responsible for all this craziness is none other than legendary director Kinji Fukasaku, known for his Yakuza Papers series and the controversial Battle Royale. Fully intending to make a commercial blockbuster, Fukasaku pulls out all the stops, including elaborate special affects and expensive, giant sets that shot the budget to 1 billion yen - a number that's considered fairly high, even by today's standards. For 1983, the amount of special effects involved was probably considered groundbreaking. Unfortunately, thanks to the rapid advances in cinema technology, a giant flying snake made with rubber probably no longer carries the same appeal it once did. The amount of imagination that went into this film is certainly something to appreciate, but watching it today means having to overlook a lot of effects that could understandably be dismissed as cheesy. Of course, overlooking the cheesy effects would be easy if Legend of the Eight Samurai still succeeds as an entertaining escapist fantasy. In many ways, it does; despite running a long 138 minutes, the film entertains thanks to the sheer amount of absurd plot elements and fun fight scenes. However, the whole thing never coheres into a complete story. Written by Fukasaku and Kamata, the film opens after everything that should have set up the story has already happened. Tamazusa has already taken over the castle, and Shizu is already on the run. Despite retelling a familiar ancient tale (and considering that one of the warriors carries a gun-like weapon, it's obviously a pretty loose retelling), Fukasaku fails to set up a story, making the absurdities even harder to swallow. Another problem lies in the setup itself: since the characters spend most of the film searching for the owners of the other six pearls, Fukasaku literally runs out of time to develop these characters through anything beyond coincidental circumstance. For instance, when Shizu is reunited with her team of protectors after being captured by Shinbei, two new warriors have already joined them from out of nowhere. By the time the climactic battle happens, the team lacks the bond that the audience needs to connect with the good guys. We end up rooting for the eight warriors only because the bad guys dispatch scary rubber snakes. As a result, the battle plays out more like the final stage of a video game without nearly enough emotions invested into the warriors.